Geek Dad: a new recurring series on tidbits for geek parents or parents of newly hatched geeks. For a long time, Disney Animation was overshadowed by the work of its amazingly talented acquisition, Pixar. It was little surprise, then, in 2007 when Disney made Pixar head John Lasseter the top guy for ALL Walt Disney Animation Studios projects. It’s been on a roll lately, with Wreck-It Ralph, a little film called Frozen, and now Big Hero 6. The film takes places in “San Fransokyo,” a gorgeous mashup of San Francisco and Tokyo that’s the bright, optimistic sibling of Blade Runner’s Los Angeles – or maybe an alternate reality where maybe Japan won World War II? Hiro Hamada, a young Japanese robotics wiz and orphan (of course he’s an orphan, it’s a Disney film! ), grapples with a tragic event and the theft of his robotics tech by a kabuki-masked villain, nicknamed Yokai. With support from his healthcare robot, Baymax, and three collegiate brainiacs (plus their kaiju-loving “mascot,” Fred), Hiro decides to use their combined tech to hero up and stop Yokai before anyone else gets hurt. 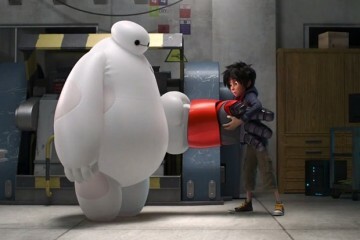 The emotional relationship between Hiro and Baymax is the heart of the film, and Baymax himself is a brilliantly designed bit of animation. He’s essentially a cross between Wall-E and a Macy’s Thanksgiving Parade balloon, but he’s the source of both the funniest and most tear-inducing moments. The rest of the team is admirably diverse, representing different ethnicities and both genders equally well, and they’re supportive of each others’ efforts, even when their first superheroic outing is a bit of a bust. Adults – especially comics fans – will enjoy the action-packed setpieces and the various in-jokes about superhero origin story tropes, plus the excellent post-credits scene. Yokai and his creepy, crawling microbots are scary, and they create some harrowing moments for the heroes, but those scenes are brief and shouldn’t overly frighten kids age 6 or older. 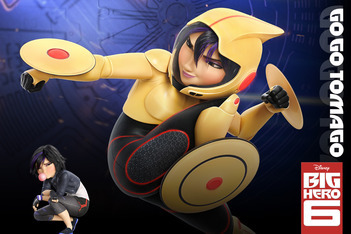 Now that the weather is turning colder, if you want to get the family out of the house for a couple of hours, go check out the high-tech heroes of Big Hero 6. And be sure to be in your seats on time, or you’ll miss a magnificent short film, Feast, also from the Disney team. You’ll smile and get choked up at the same time.